Lighthouse is pleased to announce The Same Face, a co-commission of new work by emerging artist and filmmaker Joseph Popper, in partnership with HOUSE 2015. Joseph Popper is an exciting young artist with an original way of working. He examines space travel and other forms of human exploration and technological endeavour through film, design and architecture. Taking inspiration from cinematic special effects his works transform found locations and everyday objects to simulate speculative scenarios and fictional experiences. They include The One Way Ticket (shown at the V&A in 2013 and at the Baltic in 2014) and Holiday Snaps (part of the Folkestone Triennial 2011). For HOUSE 2015, he will present The Same Face, a 1:1 scale set of a drone command centre that plays upon the uneasy similarities between an enthusiast’s homemade flight simulator and an actual drone command centre, removed from the reality of destruction. Inside, among the wall monitors, control panels and headsets, a labour of love and an act of war share the same face. 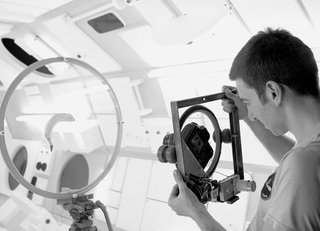 Films simulating on-board camera footage will illuminate the room. The Same Face will reimagine the 1983 IRA bombing of the Grand Hotel in Brighton as if viewed from a drone, reflecting on the new reality of terrorism at home. The associated imagery will further explore how modern warfare is rendered as if in a video game, where the edges of the real and the virtual blur in the transmission of animated pixels. HOUSE is a contemporary visual arts festival that takes place in Brighton and Hove every May, as part of Brighton Festival. Popper’s The Same Face will be one of four new works commissioned for the festival on this year’s theme of Edge and Shift. This year’s Invited Artist is the Turner-prize shortlisted artist Nathan Coley, who also focuses on the bombing of The Grand Hotel in creating new exhibition Portraits of Dissension at the Regency Town House, a co-commission with Brighton Festival. via Joseph Popper Selected For House 2015 — Lighthouse. This entry was posted on April 7, 2015 by mptask in Hove, May 2015 and tagged art, Brighton and Hove, Brighton Festival 2015, HOUSE Festival 2015, Hove, Joseph Popper, Nathan Coley, The Basement.